The numerological combination of 7 3 7 symbolically represents personal empowerment and manifestation, the 3 held in balance by the pair of 7's which directly connects to the super-consciousness. This very act of connecting grounds into the earth a way to take universal knowledge and wisdom and make it work in daily life. The center triangle is the connecting point, the bridge between personal and universal identification and represents unity. The seven sided faces embody the virtues of God-enlightening beings which again are Love, knowledge, freedom, manifestation, joy, peace and Unity. Through the use of these crystals, one can connect to the highest wisdom and can receive specific information to specific circumstances or can receive the universal truth necessary for ones growth to enlightenment. Thoughts of questions need to be clearly and precisely defined and then projected into the transmitter with an assurance that one is both ready and willing to receive, to understand, and to incorporate the yielded information. The transmitter then "beams" the intellectual resonance "out" to the source of all knowledge. The clarity of the forthcoming information will reflect the clarity and sincerity of the message of question which was sent. in the center of the crystal's facets, with a 7-sided facet on either side of it. Transmitter Crystals are excellent tools for clarifying, simplifying, and refining your ability to communicate with just about anything on just about any level. directly to higher dimensions of existence. 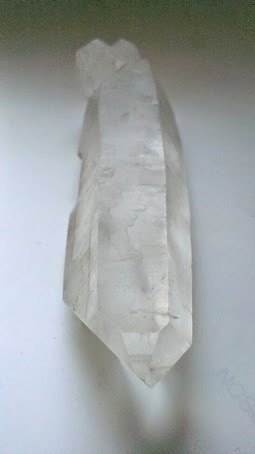 crystal is also an excellent Dream Stone and a good telepathic communication tool. Transmitters intensify your intuitive abilities and then help you integrate what you learn. develops. They also, of course, pick up the symbolism of 3 and 7. Symbolizes Trust at the cosmic or spiritual level. Symbolizes your personal power held in perfect balance by your spiritual power. 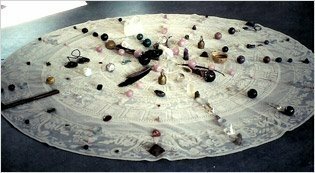 Stimulates and intensifies your natural intuitive abilities. Good choice as an affirmation tool. Excellent support when working with personal power lessons. Connects your conscious mind more directly with the Soul or Universal Mind. Helps you clarify, simplify, and refine your communications skills. Connects the Third Dimension directly to the Universal Mind energies. Represents personal power held in balance by Perfect Order and Celestial Harmony.